I’m not much of a baker. Not that I can’t bake, but I’m not very good about following measurements. I’d rather just eye ball amounts. And therefore, I’m always looking for simple desserts that don’t require a ton of measuring. Growing up, I remember making dirt at a day camp. 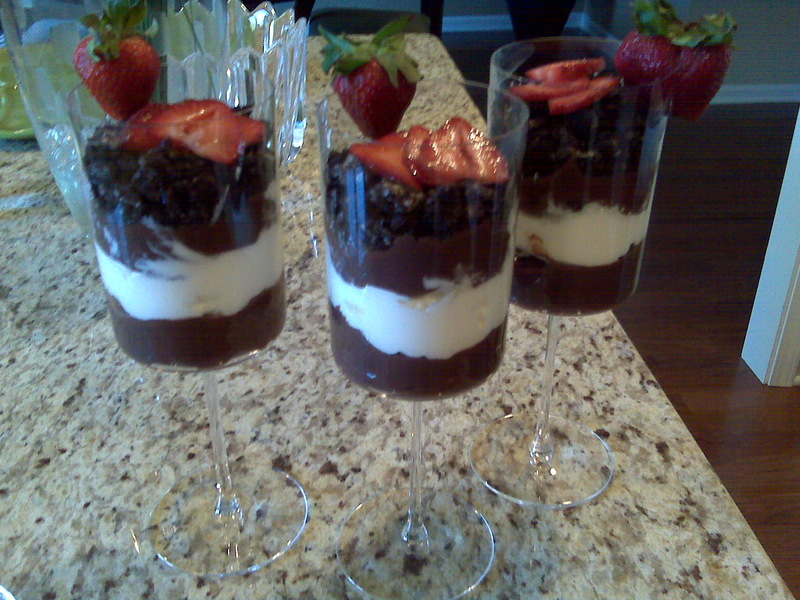 Chocolate pudding, cool whip, Oreos, gummy worms… all served in a small ceramic planter. Perfect for kids. But now that I’m an adult, I still love the simple tastes, but wanted to be able to serve it at a dinner party. The solution – serve in wine glasses and top with either fruit or edible flowers! Make the chocolate pudding according to the directions on the box. Select your servings pieces, whether it be individual wine glasses or a large truffle bowl. Build a bottom layer of chocolate pudding, topped with some of the crushed Oreos. Place a a similar amount of Cool Whip onto the pudding and Oreos. Top the Cool Whip layer with another layer of chocolate pudding and more Oreos. The top can then be decorated with either fruit or edible flowers. Or step it up a notch and dip strawberries in melted orange chocolate to create a “carrot patch”!